I feel by knitting up prayer shawls allow me to focus on what is important now. The soft yarn called Homespun by Lion Brand gives me comfort whenever I work with it. Ever since I can remember, when I first picked up a pair of needles at the age of eight, I love becoming familiar with a pattern and then see it turn into an object of enjoyment. Knitting a prayer shawl brings with it intentions; i.e. 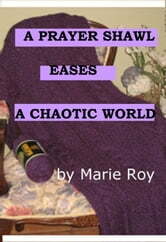 the knitter infuses healing, good thoughts, and prayers of protection into the shawl. Knitting a prayer shawl requires praying over the project while creating it. And then the finished project is also blessed and then given away. Instructions for a Prayer Shawl is included in this small ebook. Help Is Here for Facing Fear!